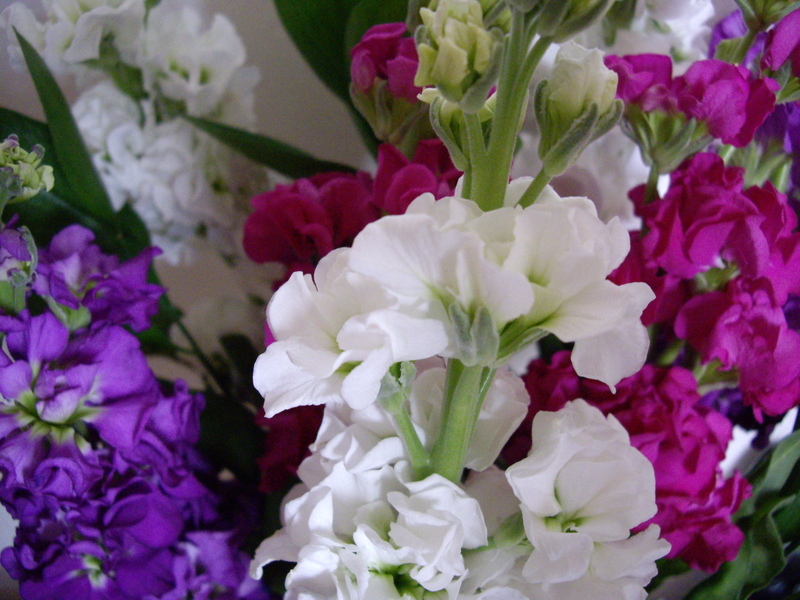 I’m still enjoying my £1.56 bargain flowers! Tidied up one of the cupboards under the stairs (I’d love to really clear it out and then tart it up but I don’t have the time/funds/patience. We don’t have an attic so the two under stair cupboards are our only storage for EVERYTHING. Thus they are never going to look show home-ish). The stuff in the upstairs one, however, is now stacked as neatly as possible and has been vacuum cleaned and dusted. Used one of those washbags designed to hang on the back of a hotel bathroom door to neatly store bath time toys. That washbag has been in a drawer for years – I’m glad I hung on to it now! The bathroom looks so much neater for this one little thing. Doing these things have made a real difference and yet the only expense has been the lampshade – the rest has come about from using things I already had (from wash bags to cleaning products) and sheer elbow grease! I hate to rely on cliches, but don’t you just hate it when it feels like you’re taking one step forward and two steps back? Just this week I have arranged to do a few extra hours a month and was looking forward to being able to put some extra in the House Fund and this morning I get a letter saying that from April we will no longer be getting any child tax credits. Don’t get me wrong, I was grateful to get them in the first place and I know the economy is down the toilet and cuts have to be made but I’m also not going to pretend that a loss of £70 a month isn’t a very unwelcome piece of news. I would have to work hours and hours to earn £70 after tax and national insurance which means that even with me putting more hours in I’m still going to end up worse off! Grrrr. 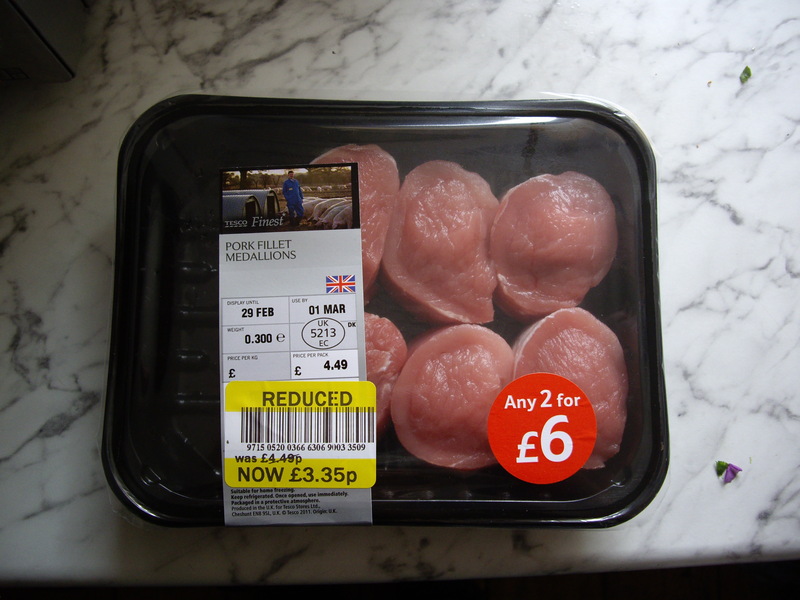 Really lovely looking Pork Medallions reduced from £4.49 to £3.35. These have gone in the freezer ready for a treat another day! Anyways, on to shopping news. Little one and I went and did the main weekly shop earlier which came in at £21.87. We tend to do a couple of extra pick ups in the week for milk and maybe fruit, bread or salad as I don’t like buying fresh stuff (that I can’t freeze) too far in advance in case it goes manky before I can use it. The £21.87 included quite a few things that had been reduced and a few non-food items, like washing up liquid and some gorgeous flowers that had been reduced to £1.56! I’ve got a fair bit of stuff in the freezer, including the results of various batch cooking sessions in the last few weeks so we should be all set. I don’t know about you, but I do much better with the whole savings lark when I’ve got a particular goal to head for and it’s something that I am feeling really motivated by. I’m becoming increasingly aware that we’re going to have to take a very low price for our home – if we’re even lucky enough to find a buyer. Combine that with the fact that I now only earn a part time wage (where previously I was the higher earner) and we can potentially only borrow a five figure sum and the whole house buying thing seems a bit unlikely/depressing. And yet we’ve lived here for 12 years, outgrown the place and are desperate to move on. I know some people are ina position to ride out these rocky times but we’re really not. So the only thing for it is to dig our heels in and really start trying to save for a bigger deposit. I’ve been working on a top secret fund (doubtlessly I’ll be able to reveal all sometime in the next five years but who knows when exactly!). I figure that if I really go for it I can have it completed in 6 months and then turn my attention to our house fund. Meanwhile we are allocating money each month from our joint account to save into the house fund with any extra bits and bobs left over (like the two month council tax break, unspent food budget etc) being transferred into savings too. With the way the cash situation has worked out we basically have £162.35 left to feed all three of us for the next five weeks – argh! That will be an average of £32.47 a week. It’s important to us that our little girl gets plenty of fruit and veg so I won’t be compromising on that and I’ll cut back elsewhere if I have to. There’s a fairly good stock of food in the freezer (as much as the 4 drawers can hold anyway) and enough bits and bobs in the cupboards I hope. I’ll try to keep blogging about the food situation through the month as, when I first started this blog, it was a really useful tool for keeping me on track. On the subject of food, now that January (and the onslaught of birthdays) is over with, I’ve had a bit more success with my weight loss. Counting from my highest weight last month to now, I’ve lost a smidge over 6 pounds which I’m really, really happy with. I’m still in the larger size clothes but I think it will only take another 4 or 5 pounds before I can start wearing some of my old stuff again. Yippee! I remain hopeful about the food budget situation over the coming month because the secret to my weight loss success is that I’m eating, and therefore spending, less. I know – shocking isn’t it? I’ve blogged before about why so many of us find it so hard to follow a common sense approach to weight loss. I, like many others, am more comfortable with a set of rules to follow. Recently I even had a crack at calorie counting which was good on one hand because I could have a bit of whatever I liked but was also bad because what I generally want is cake and that isn’t particularly good for you. It is also hard finding something that fits in with your particular lifestyle. Anyway, I’ve basically lost the weight by eating 3 healthy meals a day and absoloutely ZERO snacks. ZERO. It works – plus it is a much cheaper way of eating so win, win! It’s been so long that I’ve been blogging properly that I had practically forgotten my log in details! There hasn’t been any particular reason for my quietness other than being busy and not having much to say. And, also, because I felt I needed a bit of a break from budgeting quite so heavily. I’ve read before about some people alternating month by month from being very frugal to being a bit freer with the purse strings. I can understand this! I’ve had another set of garage bills that have cocked up the budgets but at least we were able to pay for the repairs (and the oil change!) and my car is ship shape and roadworthy now. We did have one bit of good news which was a tax refund. The money has gone straight into our house fund which means we’ve already surpassed the goal of £500 for Jan-March. We’re still going on it though – I want to get as much in as possible this tax year! As for my goal of £600 – hmm. I’m going to try but I doubt I will quite make it. I’ve already managed to save £300 but I only have one more pay day before the end of March and there definitely won’t be £300 available! I’ll get as close as I can though. I’ve also resurrected my ebay and Paypal accounts and have sorted a few things out to put on ebay. I’m hoping to get a few listings up by next week. It would be great to make a bit of extra cash. Speaking of which, it is always the food budget that seems to get slashed when I need to cut back or save more. Probably because not much else in the budget can be cut! Anyways, I’m still here, plugging away trying to get some savings in the bank for all of our plans! So, how did I get on with my ‘goals’ during January? Well, it is just as well that I set them quarterly because there hasn’t been much progress! Financially it has been a stretch with all of the birthdays (which I’ve blogged about before so won’t bore you with again) and also the two MoTs. My car needed all 4 tyres replacing – awesome. It also needs an oil change but it is just going to have to wait as I simply don’t have enough cash to pay for it. I said that I wanted to save £600 into my ISA by the end of March – I’ve got about £50 towards that so far! And I think we’ve got £100 towards the £500 savings target for our Joint savings/house fund. Still, we didn’t expect much from January so it isn’t too great a disappointment. The weight loss thing…I’d give up but I just can’t! There has been a fair amount of going out / cooking and baking special meals what with all of the birthday-ing. The best I can say is that a) I haven’t put any more ON and b) I have got used to doing exercise DVDs. They have become part of the rhythm of the week which can only be a good thing, right? I’ve been doing a longer exercise routine (ie 30-40 mins) 3 days a week (always at 7am otherwise it would never happen) and one or two sessions twice a week from the ’10 minute workout’ DVDs. I am planning on paying very close attention to my eating and exercising for February and am hoping to report some success at the end of the month. This should be easier as there is only one birthday coming up and it is unlikely to involve a lot of cake! It should be easier to make some goal related progress in February as there are far less obstacles and far more opportunities to be healthy and thrifty. Bring it on!